This is absolutely great for the scorer and the spectators to see the times straight away, will be great for open days and demonstrations. 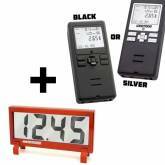 Works really well with our CED 7000RF timer both are a good investment for the club. The display is the best thing to have in a range for the other shooters to observe the accual time while a shooter is running a course of fire, we have set it up at the range and it works perfectly, a must have for a competition day, great item. 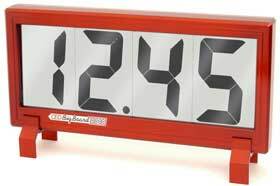 The CED BigBoard is a large remote LCD Display Board that provides synchronized connection to a host linked timer giving actual time as it is recorded up to 50 yards from the timer itself. Large enough to be seen from a great distance, the CED Big Board is ideal for club, match, or spectator use. 370x175x45 mm / 14.6" x 6.9" x 1.75"
Custom Case for easy storage and protection included. Will work with the CED7000 and CED8000 RF model timers. Q: Can I review my shot strings on the Big Board? A: Unfortunately, you cannot. The Big board will only display the shot times recorded on the timer and you cannot review them on the big board. You can however review your shot string on the 7000 timer itself. The Big board and 7000 are not intuitive with one another, but spectators will be able to see your shot times and the final time of your string, which remains on the display until the next string begins.